The Anolon Advanced+ 28cm Covered Sauteuse is a sophisticated and professional option for the discerning home chef looking for superior quality and performance, backed by a lifetime warranty. 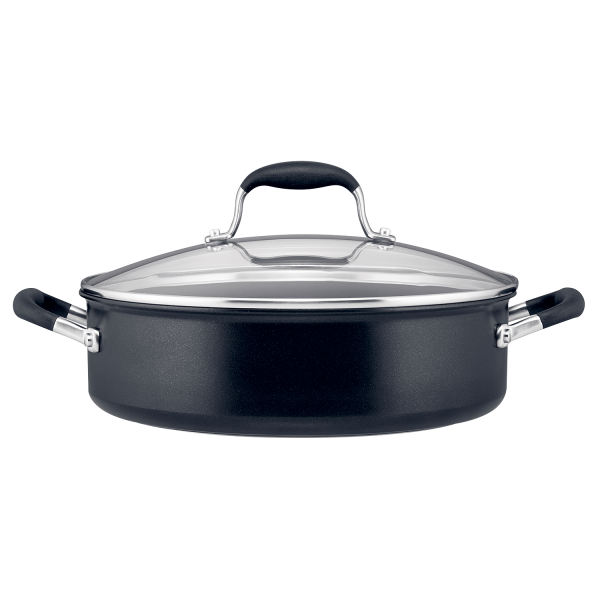 This is the ultimate family pan, with a large wide base and high sides it's perfect for frying meat, Sautéing vegetables, and cooking delicious curries and sauces. Supremely versatile and convenient, this pan can be used in the oven to 200°C and put in the dishwasher for easy cleaning. Anolon Advanced+ 28cm Covered Sauteuse is rated 4.5 out of 5 by 2. Rated 4 out of 5 by Kitchen Whiz from Good Saucepan I have always liked Anolon, but was unsure about wether the wider shape would be suitable. Cooks very well, just takes a bit of time to heat up.